The 2nd Economic Coordination Meeting for Europe Region held in Bern, Switzerland, 24-25th July 2018. 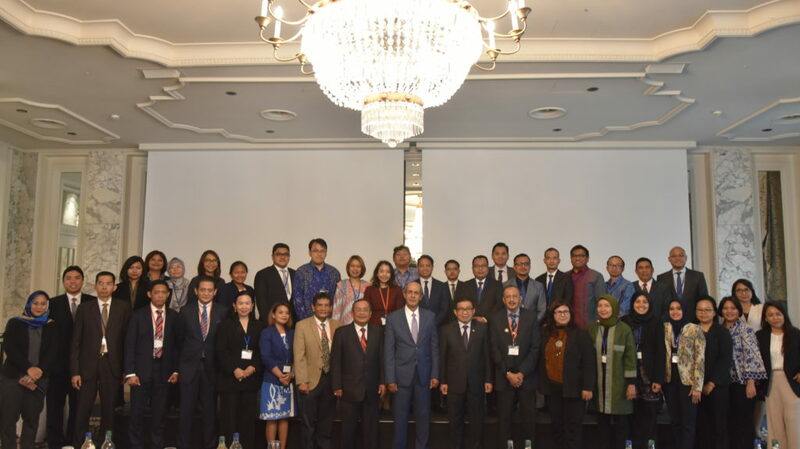 This event had brought together number of high-level speakers and Economic Function of the Embassies of Republic of Indonesia in Europe Region. The objective of this meeting was to strengthen collaboration among Indonesian Embassies and relevant stakeholders in order to sustain an integrated TTI promotion strategy. The 1st Economic Coordination Meeting for Europe Region was held in London in 2017. The meeting was opened by H.E Prof. Muliaman D Hadad, the Ambassador to Switzerland and Liechtenstein, talking about the recent challenging global events, such as trade war and Brexit. H.E Prof. Muliaman D Hadad encouraged the participants to rethink about the economic diplomacy approach. Since the current approach is no longer suits the economic situation in this era. Later, H.E. Hasan Kleib, M.A, the Permanent Mission of the Republic of Indonesia to the United Nations, World Trade Organization, and Other International Organizations in Geneva, Switzerland reviewed recent development of Indonesia’s cases at WTO, and how Indonesia really needs to develop innovative ideas combined with advanced technology in order to strengthen its local industry and increase its Global Innovation Index which currently is sitting in number 85th. H.E Dr. Rizal Sukma, the Ambassador to United Kingdom and Ireland in his remark believed that during the political year (2018-2019) in Indonesia, businesses do not have to feel anxious because Indonesia has reached a mature level of democracy. This is also shown by the previous political years in Indonesia that always went well, safe, and did not cause disturbance to the economic condition. Muhammad Anshor, Directorate General of American and European Affairs at Ministry of Foreign Affairs, emphasized the needs to improve the coordination of TTI promotion among Indonesian Embassies and its counterparts/partners in Europe. Since the 1st Economic Coordination Meeting for Europe Region held in London last year, Muhammad Anshor has appreciated some initiatives and improvements of the new integrated TTI promotion. Tamba Parulian Hutapea, Deputy Chairman for Investment Planning at BKPM, delivered investment realization data of Foreign Direct Investment (FDI) from 2015 to Q1 2018 and investment target in 2018 and 2019. Tamba Parulian Hutapea also explained about the new platform of investment procedures in Indonesia, that is OSS (Online Single Submission). This new platform is created to accelerate the investment realization, and to make the procedures of investment faster and more transparent. Further, Sandy Agung Raditya, the Economist at Bank Indonesia in London, shared about the current development of digital economy in Indonesia. After opening session, the event continued with two separate panel discussions – the high officers at BKPM, Trade Attaché, Bank Indonesia, and Mayor at Natuna Regency. The session discussed about current developments on European economic and its impact on Indonesia’s Economic Diplomacy. Later, the second panel discussion brought together the Executive Director at Bank Mandiri (Europe) Ltd and Maurits Bruggink, Chief Executive of Indonesian Chamber of Commerce and Industry in Europe Region. Both were promoting the cooperation that could be collaborated between their good institutions and Indonesian Embassies in Europe. The 2nd day was the core event, Economic Coordination Meeting for Europe Region between Economic Affairs department of Indonesian Embassies in Europe Region, IIPC London, and Bank Indonesia Office London. There are three sessions; the 1st session was chaired by Dino Kusnadi, Director of Europe 1 Affairs at Ministry of Foreign Affaris. The 2nd session was the sharing session among the participants regarding recent and future agenda if TTI promotion. Lastly, the 3rd session chaired by Theopita I. Tampubolon, Deputy Director at IIPC London. The 2 days meeting, closed with remarks from H.E Prof. Muliaman D Hadad, the Ambassador to Switzerland and Liechtenstein, that emphasized three main messages: that the Indonesian Embassies have to be able to identify opportunities and maintain networks with counterparts; encouragement of mutual relationship between countries; and maximizing the promotion mechanism and good collaboration.